A frozen shoulder is when the joint has significant loss of its range of motion in all directions, a frozen shoulder is medically referred to as adhesive capsulitis. 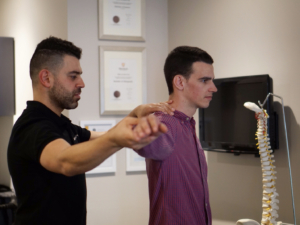 The symptoms of adhesive capsulitis (frozen shoulder) usually follow minor trauma or if the shoulder has been kept immobile for an extended period of time. The ‘freezing’ stage. You may experience a gradual rise of pain. As the pain increases, your shoulder loses its normal range of motion. Freezing typically lasts between 6-36 weeks. The ‘frozen’ stage. Painful symptoms may actually improve during this stage, but the stiffness remains. During the 4 to 6 months of the “frozen” stage, simple daily activities like putting on your clothing may become difficult.